The beach is just steps away from Alizee Villa. Not just any beach, but Taylor Bay! Taylor Bay is a great choice for families, since the water is clear, shallow, and calm thanks to the Ocean Point peninsula’s protection. There’s a deck and shower down by the shore so you can spend hours by the sea, although the deck back at the villa is equally gorgeous. Alizee villa, built on a bluff overlooking Taylor Bay, offers guests privacy and luxury on two acres of well-manicured land. Vibrant foliage and ocean views emphasize Alizee’s picturesque, tropical location. Sunbathing on the terrace and floating in the pool as the trade winds fan the palm trees is total bliss. Dine al fresco in the gazebo, then take a walk down to the beach to gaze at the sound and swim in Taylor Bay. There’s even a shower down by the shore to rinse off in. Back at the villa, the living and dining areas have nonstop ocean views through walls of bay windows. A clean, open design makes this villa feel like a home away from home, with several nooks to enjoy a meal or play card games in. Every room is bathed in sunlight, and most of the rooms flow into one another to create an intimate atmosphere. The kitchen has a breakfast bar, wide countertops, and basic appliances, so guests can cook with ease. The formal dining room opens onto the upper deck’s covered breakfast area. Alizee’s bedrooms are spread throughout the main house, guest house, and pool house. The master bedroom in the main house features a king-sized bed and an ensuite bathroom with a walk-in shower. The main house’s guest bedroom has an ensuite bathroom and two twin bunk beds. The guest house provides privacy and independence, equipped with a kitchenette, queen suite, and ensuite bathroom. The pool house holds the last two bedrooms, which both have king-sized beds and ensuite bathrooms with indoor and outdoor showers. Taylor Bay is known for powder white sand and clear, turquoise waters. This beach is a favorite for families, as the water is shallow and calm. Villa sits up slightly higher, short walk on a stone path to the beach. Air conditioning usage is metered separately and will charged to guests at market rate. Car rental, private chef, butler, server, daily maid service, grocery and beverage shopping (pre-arrival and during your stay), liquor and wine delivery, nanny service, baby equipment, spa services, yoga and personal training, photography, and private airport transfer/car service can be arranged for an additional fee. This villa is actually even better than it looks on the website! We have rented more than a few villas in the Caribbean over the years, and this one stands out. It is beautiful, generous, and has top of the line everything. The beach is down a stone pathway, and it’s perfect. If you need lots of crashing waves, it may not be for you. It’s mostly private, and perfect for boards, kayaks, swimming, and walking. The best part of the day started in the late afternoon and lasted until the beautiful sunset. The five bedrooms provide comfort and privacy, as they are set away from each other. The master has an indoor shower as well as a terrific outside shower. Shawna is available, friendly, and takes care of whatever you need. It’s good to know that you can call her as you prepare for your trip. Alizee is a beautiful, large, well-maintained home. The interior is newly furnished and the kitchen is totally stocked with every item, convenience, and gadget. There are two full-size refrigerators as well. Each bed/bath suite had ample linens. The beach towels are plentiful, and the maid service was prompt and reliable. The house lacked for nothing. The beach is a two-minute walk on a well paved path, and was the highlight of the trip. I have never seen an area with such shallow, calm, and clear water. The beach was truly amazing, and I say this after 40 years of extensive travel. Adults and kids alike equally enjoyed the beauty and ease of the water. Andrew could not have been more thorough or attentive as I worked to make my summer plans. After I secured the rental, he continued to be helpful. I especially appreciated his quick response to questions or emails. He did not abandon me after I arrived in TCI. His support was 100% for the duration of our trip. Thanks, Andrew! Julian was my TCI contact, and again, he was attentive and quickly responsive to my every need or question. My experience with WhereToStay indicates the company is staffed with professional, quality personnel. When traveling in a foreign country, it’s an important, comforting factor that cannot be underestimated. Alizee surpassed all of my expectations and, as my family knows, my expectations are very high. We were escorted from the airport to Alizee. Everything our rental agent had said about the villa was spot on. It is at the end of a private drive. The surrounding vegetation is exceptionally beautiful. It sits on approx. 3 acres of lush landscaping and natural beauty. The views in both the front and back are of Taylor Bay. The villa is beautifully appointed with immaculate housekeeping. The kitchen is well-stocked for any food preparation you would like to make. Everything is clean, neat, and well organized. There are numerous places for a family of 8 to eat together. The pool is warm without being heated and large enough for our 6 children to frolic. The paths to the beach are paved with limestone steps and there’s an outdoor shower for rinsing off sandy feet. There are 6 lounge chairs for seating at the beach. The beach is tranquil and goes out for at least 100 yards without getting over waist high. There is no surf, sometimes slight waves, so children as young as 2 and 3 are safe. What more can we say, it was a beautiful and memorable experience being at Alizee. Andrew was a true professional. He was very responsive and accurate in his portrayal of Alizee. He is well acquainted with the villa and the island, so you can rely on him to give you all the information you need in advance of your trip. Alizee is a great villa on the beautiful private beach of Taylor Bay. The villa was well equipped and very comfortable. We didn’t realize we had to pay for air conditioner, but it was not too bad for a week of use. It was nice to be away from the chaos of Grace Bay. Taylor Bay is definitely one of the best beaches in Turks. We hired a car, which was definitely needed. 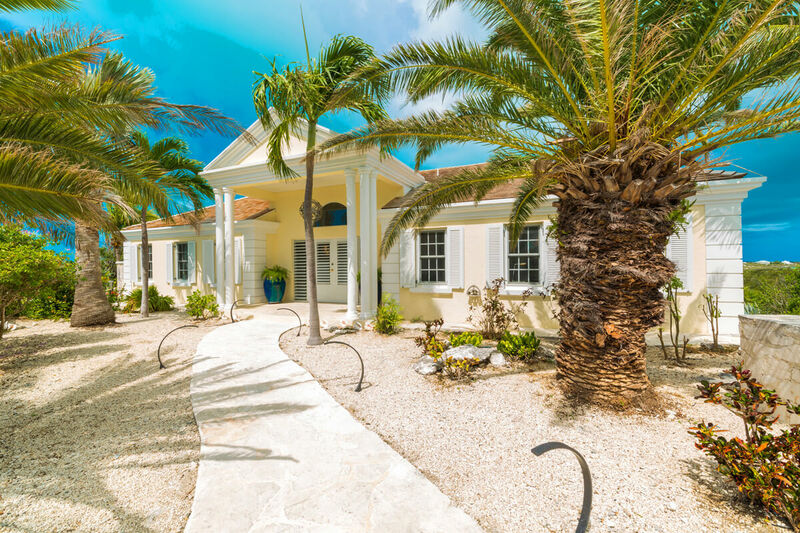 Everything was perfect, and we will consider this villa again if we go back to Providenciales. Andrew was great. He kept in contact with us and very informative. Beautiful Villa on the most perfect beach! Alizee Villa was absolutely perfect for our family vacation. We are all adults so the house was perfect for everyone having their own space. The pictures of the house were perfectly accurate. Everything you could possibly need is there. I was worried that we were too far from the beach, but there was a beautiful private path to the beach. The setting is very private but close to everything. The managers were very responsive to anything we needed. One thing that worried me was having to pay extra for AC, but we never turned it on. There was a beautiful breeze at night. I was very worried to rent online sight unseen because I have heard of scams. I went ahead after talking with Andrew, and everything was perfectly organized. Andrew was very responsive to every question I had. I would definitely do this again and use Where to Stay and work with Andrew. Thank you so much. Villa Alizee was everything we expected and more. The view was spectacular, access pathway to the beach unique and the interior furnishings offered very comfortable settings. Our group of eight adults were extremely pleased in choosing this villa. We could not have asked for more and would consider a return trip to Villa Alizee. We have had a great connection in choosing Where To Stay especially the professional attention to details offered by Sharon. She has been superb! Also, Julian, our on island representative, made our stay an easy and thorough transition. He was very professional and exceeded our expectations. We commend the owners for selecting this management team. We spent a week at Alizee with another family. We had 4 boys between us, ages 5, 8, 8, and 10. Th house was perfect for our group, the boys slept in the bedroom houses and the adults in the two pod bedrooms situated on either side of the pool. This allowed the boys a chance to wake up early and watch tv and play while the adults could sleep in a bit. The house was clean, lovely and very well equipped. The pool was beautiful and the outside space had great views and plenty of lounges and shady areas. The highlight for us was the incredible beach where we spent most of the day’s swimming, snorkeling, and boating (we rented paddle boat and a canoe for the week). We drove to many other beaches during the week to snorkel, eat out, or explore but we honestly felt that Taylor bay beach was the calmest, cleanest, and prettiest spot of all. It was a perfect week and I wish we were there now. Andrew was informative and very easy to work with. He was knowledgable, helpful, and responsive, a real pleasure to work with. From the moment we pulled up to the time we left we had an amazing vacation! The villa was perfect and the views were breathtaking! The pictures accurately reflect how the villa looks but it was even better in person. The villa was well stocked with all we needed to enjoy the pool/beach as well as the kitchen. We were seven people and we all enjoyed the pool and beach every day making it the best vacation ever. No one wanted to leave and we hope we get to come back soon. Andrew made himself readily available to answer all our questions(and there were many). It was a very easy process and any concerns we had were addressed. He also gave us an endless list of restaurants and things to do. Thank you Andrew for making this a vacation we will always treasure!!! This villa was wonderful. The sea was a short path away that was lined with beautiful plants. The house was beautifully decorated and had a well equipped kitchen. The bedrooms were perfect and the pool and patio area met our every need! Andrew @WhereToStay.com answered every inquiry and question that I asked. He helped us along the way and made sure we were ready to go when our vacation started. Awesome Stay at Villa Alizee! Villa Alizee was definitely the best way to kick off our week in paradise! We were an extended family and occupied every bedroom in the house (including the guest house). The accommodations were comfortable and the pictures accurately reflect how nice the furnishings are. The main attraction was the view! Breathtaking views each morning of bright blue water and each night of colorful sunsets (the house faces west, so we had a perfect, unobstructed view). We ate every meal under the cabana by the pool just to ensure we soaked it all up! The private path down to the most beautiful, white, sandy beach made shuffling between the pool and the ocean a breeze. As first time visitors and not knowing the area, after exploring other parts of the island (including Grace Bay), we were so incredibly thankful we stayed on Taylor Bay. The beach is the most beautiful we saw and even though it is a public beach, we had it all to ourselves most days (and we were visiting during the busy season!). The shoreline stays only a 1 or 2 feet deep several yards out into the ocean and is crystal clear water, which makes it perfect for lazy floating and little kids. All in all, we couldn’t believe how lucky we were in landing such a great place to stay, so much so, we want to come back again next year! I’m not sure how we can accurately put into words just how helpful Shawna @ WhereToStay.com was in planning our stay. Shawna answered every single one of our hundreds of questions with so much patience! She helped take a lot of the guess work out of planning our activities, and her recommendations for places to eat and tour groups to use were spot on. Having a vacation guru like Shawna, especially as first time visitors in a foreign country, was invaluable! We would most definitely plan another vacation through WhereToStay.com with Shawna in the future. Just returned from the best vacation of my life. The villa was simply spectacular. The villa and grounds are well planned, well built and well maintained. Julian and his associates saw to our every need even providing additional umbrellas for the beach and floats for the pool. Don’t pack a lot. After settling in here, we never left! After searching VRBO/Homeaway, etc., I realized I knew nothing about the islands. Contacted Andrew and his staff with a wish list. He promptly provided a list of properties that met our criteria with some suggestions. A quick phone call narrowed the choice to the villa that made our vacation. Along the way, he also provided valuable suggestions and recommendations on where to dine, snorkel, things to do etc. Julian, the property manager on the island was also great. He welcomed us to the house and gave us the tour as well as promptly addressing all concerns and questions we had during our stay. The Villa was beautiful and family suited. We had 4 grown children and one toddler staying with us. Plenty of room for all of us. The two cabanas were a welcome surprise especially with an early rising toddler. The location and the beach were perfect, very secluded. The management staff was above and beyond, very accommodating. Where to stay was was wonderful to work with. Very knowledgeable and helpful with my many questions. The property and home are gorgeous. The beach couldn’t be more perfect. I think this area is the nicest part of Provo. The house has a lot of supplies for the pool and beach which was great. The home had some electrical issues during our stay which I’m told are being addressed by the owner and property management company. We hope to go back. Discount of 15% off rental rate. Applies to bookings 7 nights or more. Good for stays from Apr 27, 2019 to May 4, 2019.